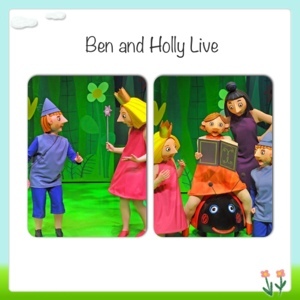 We have always been big Ben and Holly fans in our house and when I read the fantastic reviews of the live show, I knew it would be the perfect introduction to theatre for my 2 year old. It was being shown at the playhouse, which in my opinion is the most family friendly theatre in our region. Tickets were priced at £13 each. The show starts to the familiar theme tune and it was lovely to see the delight in all of the toddler faces in the audience as Ben and Holly appeared on stage. There was audience participation right from the start, beginning with a game of hide and seek and it was lovely watching Jack join in shouting and pointing at the stage. The stage show takes bits and pieces from various Ben and Holly stories - we see Gaston the ladybird play fetch, Nanny Plum being the tooth fairy, Ben elf being turned into a frog and the elf band rehearsing for King Thistle's birthday and of course the show would not be complete without a jelly flood which had Jack in fits of giggles! The star of the show for me was Gaston the ladybird, who was just as cute, adorable and full of personality on stage as he is in the tv show. 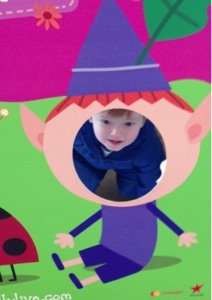 The stories are played out with lots of toddler friendly songs and the larger than life characters certainly kept Jack's attention throughout. My only gripe was the over-selling of and over priced merchandise on sale. The stand at the foyer was full of Ben and holly goodies, staff walked the aisles at the interval selling more merchandise and programmes and then there was a lady selling Ben and Holly balloons on exit. 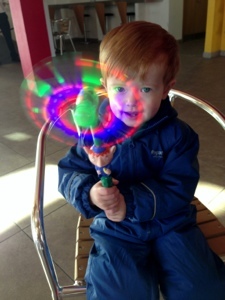 I couldn't resist buying Jack a Ben Elf light on a stick, which at £7 was not cheap! Despite this, we both still had a lovely time and I would certainly recommend it to children aged 0-4.